History - Coalition of Multicultural Educators, Inc. 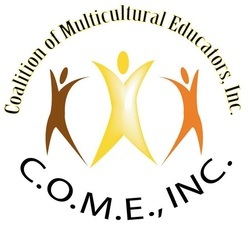 The Coalition of Multicultural Educators, Incorporated (C.O.M.E., Inc.) was organized in 2000 by Daniel J. Brinson, Sr. (school counselor) and Barbara H. Brinson (school psychologist) employed by the then Cleveland Municipal School District. They recognized the lack of or under representation of minority and bi-lingual school psychologists and school guidance counselors in large urban school districts, namely CMSD. Daniel and Barbara invited other minority and bi-lingual school counselors and school psychologists to join them in their endeavor to augment the presence of minority and bilingual professionals. The individuals who joined the organization also shared a belief in published research data that indicates academic and social-emotional growth of children are maximized with positive roles models of their same culture. In January 2003, the Coalition of Multicultural Educators was incorporated as a non-profit organization in the state of Ohio whose goal is to help secure higher numbers of minorities and bi-lingual professionals in school psychology and school guidance counseling. May 6, 2006, the organization obtained 501©3 federal tax exemption status. Our main function is providing scholarships to graduate minority and bi-lingual students pursuing careers in school psychology and school guidance counseling. Other priorities include professional development, recruitment, hiring and retaining bi-lingual/minorities school guidance counselors and school psychologists. Since our inception we have provided ongoing mentoring for those seek our assistance. Additionally, C.O.M.E., Inc. visits and has established relationships with colleges and universities in the Greater Cleveland Area. One of our most successful mentoring efforts involved forging a relationship with the Cleveland Municipal School District (now known as Cleveland Metropolitan School District) to share C.O.M.E., Inc’ s vision. As a result, CMSD agreed to interview qualified applicants and eight minority school psychologists and three-minority guidance counselors were hired. We have held nine scholarship fundraisers since 2004. Twenty-Three students meeting established criteria have been awarded scholarships. At this juncture, we also provide professional development via our website, newsletters, scholarship events and participation in community forums. We hope to encourage other professionals to join us as we continue growing and expanding our organization’s vision.